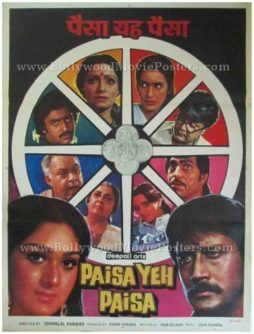 Classic Bollywood film poster of the Hindi movie Paisa Yeh Paisa (1985) for sale. This is an actual surviving classic Bollywood film poster of the 1985 Hindi movie that starred Jackie Shroff and Meenakshi Seshadri in lead roles. Printed and circulated during the original first release of the film (somewhere in the early 1980s), this classic Bollywood film poster was designed for publicity of the film but never ended up being used. This classic Bollywood film poster was originally designed by one of the greatest poster designers of his time, V.G. Parchure of Pamart studio fame. His printed signature in the name of his art studio is seen on the bottom right hand corner of this classic Bollywood film poster. True to the money oriented title and theme of the film, the photographic stills of the lead actors are encased in a gigantic coin like circle. Coins are seen pasted in the center of the circle. Jackie Shroff and Meenakshi Seshadri are seen in prominent photographic stills at the bottom of this classic Bollywood film poster. Classic Bollywood movie poster of the Hindi film Paisa Yeh Paisa (1985) for sale. This is an actual surviving classic Bollywood movie poster of the 1985 Hindi film that starred Jackie Shroff and Meenakshi Seshadri in lead roles. Printed and circulated during the original first release of the film (somewhere in the early 1980s), this classic Bollywood movie poster was designed for publicity of the film but never ended up being used. This classic Bollywood movie poster was originally designed by one of the greatest poster designers of his time, V.G. Parchure of Pamart studio fame. His printed signature in the name of his art studio is seen on the bottom left of this classic Bollywood poster. 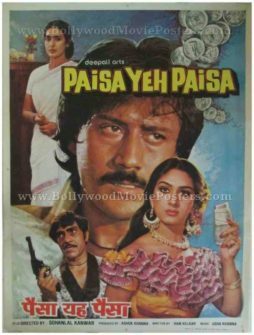 True to the money oriented title and theme of the film, currency in the shape of both coins as well as notes is seen in this classic Bollywood poster. Jackie Shroff, Meenakshi Seshadri and Nutan are seen in prominent photographic stills. 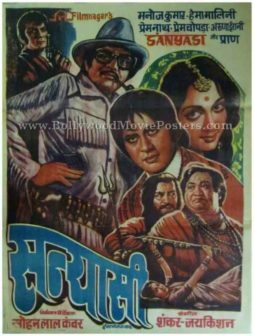 Villain Amrish Puri is seen holding a pistol at the bottom of this classic Bollywood movie poster. 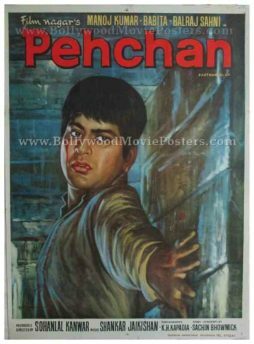 Old Bollywood movie poster of the hit Hindi film, Pehchan (1970) for sale. This is an actual surviving original vintage Bollywood movie poster of the 1970 Hindi film that featured Manoj Kumar (popularly referred to as “Bharat Kumar” for his patriotic roles) in the lead role opposite actress Babita. The film was a hit at the box office and won several Filmfare Awards (mainly for its music), making this poster highly collectible! This old Bollywood movie poster was originally hand painted on canvas by one of the most acclaimed Bollywood poster painters of his time, D.R. Bhosle. The printed signature of Bollywood poster artist D.R. Bhosle is seen on the left hand corner of this vintage Bollywood poster. This hand painted Bollywood poster is typical of D.R. Bhosle’s minimal approach towards Bollywood movie poster design. A stunning solo hand painted portrait of actor Manoj Kumar is seen in this minimalist Bollywood poster.